Hi, I am interested in your 1966 Ford Mustang (stock #4926-CHA) listed on Autotrader for $39,995. I'd like to get more information about this vehicle and confirm its availability. Attention Mustang lovers and anyone out to find a truly rare classic, this is a 1966 Ford Mustang Lone Star Limited Bluebonnet Special . If this all sounds like a mouthful, just read on about all the details on this restored limited edition coupe that could be the only one youll ever see. It takes a pretty big Mustang lover to know about some special editions like the California Special or High Country Special, but it takes an almost expert-level understanding to know the Lone Star Limited. This was a special run of Mustangs just for Texas, and thats why they are all painted after the state flower, Bluebonnet Blue. This was not a very well-known special edition with only 175 examples made for 1967, and its believed that just a handful were finished in time for the 1966 model year and this is believed to be one of them! The special DSO variation on trim tag also backs this up. As a special edition, this has received the right care over the years. Its a low mileage example (averaging around 1,300 miles annually,) and it includes a comprehensive restoration mid-life. So the special Bluebonnet Blue really knows how to grab attention in the sunshine as this rare color retains a terrific high gloss finish. The brightwork is mirror-like on everything from the form-fitting bumpers to the styled steel wheels. And speaking of bright, the white vinyl top gives this coupe even more vivid and premium distinction. You even have the proper Lone Star Limited logo magnets affixed to the car. 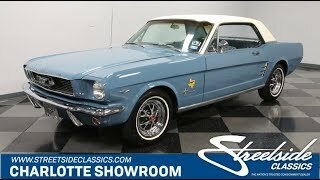 Inside the blue and white of the exterior continue to really drive home how special this pony car is. And speaking of ponies, you get plenty of them on the deluxe Pony seat trim. This has all the best period-correct features, like the three-spoke sports steering wheel with wood trim that nicely coordinates with the dash. Theres also the center console, AM/FM radio on display, and cool Rally Pac tach and clock mounted on the steering column. Even the trunk is correctly finished. While all this makes for a great car to display, its also a pleasure to drive thanks to nice upgrades like the armrest center console with cup holders (removable) and cold-blowing R134a air conditioning. Under this hood is Fords famous 289 cubic-inch V8. This is the correct displacement for this C-code car, and its even believed to be the original block. There have been some nice investments over the years, and so you get the bright air topper, Mustang performance valve covers, and an overall tidy setup. The V8 inhales deeply through a four-barrel carburetor, which also contributes to a sweet sound out of the dual exhaust. The motor fires up nicely, and it feels good out on the road as it combines with easy driving features like the three-speed automatic transmission and power steering. The sale comes with the right paperwork, including a copy of a letter from the original owner. Theres also the owners manual, service manuals, car history photos, and an appraisers report. So while its been impossible to verify that there was a 1966 Bluebonnet Special (even the 1967 cars are nearly impossible to locate) this example has all the right supporting documentation to believe this could be the only one currently known anywhere. Thats makes this striking coupe a truly irresistible proposition. Call now!